God bless the VAT man! Because my ‘portfolio career’ includes some management consultancy (telling other people how to get organised), he gives me back the odd pence I’ve paid for him on my petrol or my new laptop. Much more important, albeit unplanned, the VAT man has given me a discipline: every three months, like clockwork, he demands feeding. So my accounts are never more than three months in disarray. I have inherited the word-appreciating gene – and its near neighbour the envelope-aversion gene (the one that shuns admin in any form). The two seem to go together, like blue eyes and blonde hair. A family reunion last year made it clear that these breed true in our gene-pool: Great Grandma Elizabeth Surr wrote little books for children (Good out of Evil, Thomas Nelson, 1876 – anyone with others of Mrs Surr’s tomes will find me a willing buyer). She also had what was known as the ‘money basket’, into which she put anything having to do with the filthy stuff. Once in a great while she would carry the money basket distastefully, at arm’s length, to her writing desk, pay the absolutely essential bills, or list for her businessman husband some of the necessary expenditure information. Most of Mrs Surr’s descendents share the editorial bent and the fiscal disinclination. My bookbinding spouse, unafflicted with VAT (or envelope-aversion, for that matter), goes through paroxysms every January when the income tax man loometh. He’s forgotten how to use the Money Manager software. He’s misplaced most of his receipts. He can’t remember if those people from Holland paid cash or a cheque. He vows he will keep his accounts up to date henceforth. He vows it every January. Now the VAT man is threatening to put five per cent on the price of a book – or the cost of a book. In a bookshop delicately balanced between the collectors and the caravan trade (try being cooped up in a mobile holiday home with three kids for a rainy weekend in the Highlands! ), I depend on the £2 paperback to keep me in business. No £1.50s, we long since agreed. It’s a £1 or a £2 (and sometimes nowadays a £3). The VAT man wants me to charge £2.10 and send him the difference! We’d get writer’s cramp putting each one on the tally. ‘They do it in most European countries,’ say the newspapers. They do it on ABE, too – and that doesn’t make the extra five per cent any more loveable. When I can’t charge £2.10 I just swallow hard and have a little less room to swing – and that may make a major difference in any marginal business. Worse yet, if I weren’t already a VAT trader, I would probably to try to keep my book business so small it would slip under the VAT threshold – but that wouldn’t really save me from the record-keeping. The VAT man will have his due; I’d just be exempt from getting the petrol pence back. If we get VAT on second-hand books, how do we handle the ones we bought pre-VAT, but have to sell post-VAT? You can see whole committees of quill-sharpening envlope-generators rubbing their hands together with glee. That raises the Big Question – the first thing I learned about the second-hand book business, from my old London friend Graham Weiner. What’s your stock worth? My accountant asked the Question again in January, and I airily dismissed it:’Oh, about the same as last year, maybe up five per cent.’ It’s not worth what I paid for it. Nor is it what I’ll get for it. I took in five boxes of books the other day. Three volumes of Sir Walter sold almost immediately (wonder of wonders!). I listed a Thomas Paine tome, and a couple of Seton Gordons, and a rough copy of The Harp of Perthshire. Sir Walter has thus a real market value – the £10 my customer chose to pay for the trio. To the extent my whims, lookups and experience are valid, Paine, Seton Gordon and the Harp have ‘real’ market values – unless they repose out there in the ether for a year or so without anyone noticing. (Actually, the Harp has already gone.) Any offers for four and a half boxes of leftover stuff? Is it trash or treasure? Who is to decide – and how? While you cope with that question, I’ll get out my money-basket, and get on with doing my VAT. 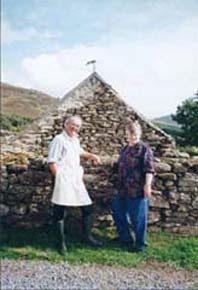 Atholl Browse is now run by John and Mary Herdman, open daily 10 to 6 (from noon on Sundays). It’s situated right beside the railway station in Blair Atholl, Perthshire. Telephone 01796 481 530.